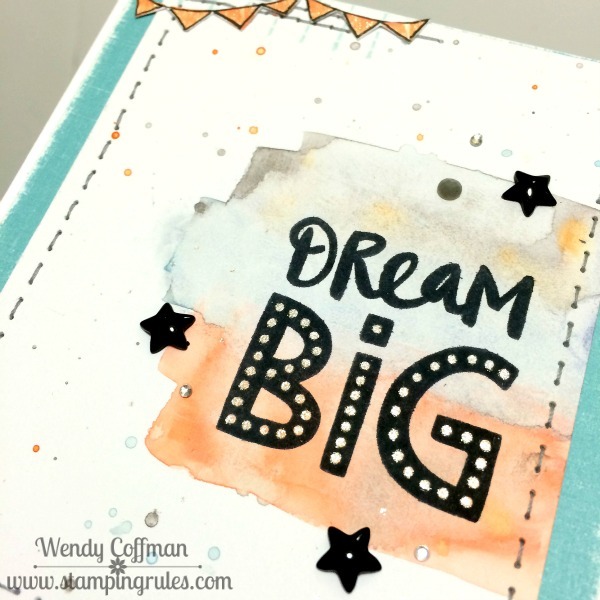 Welcome to the November Stamp of the Month Blog hop! This month we have 37 talented consultants sharing their crafty creations using Cheers, 2016!, a festive set of 16 stamps. You may be arriving here from JEN'S BLOG. Let's hop! I started with the sketch over at the Friday Mashup. I painted a swatch of watercolor paper with orange, blue, and grey paints, inspired by a conversation I had with with my sweet friend Sheryl when she saved me by providing the November SOTM set to me when I couldn't find mine. She does amazing retreats! I got my color combo from this week's Color Throwdown challenge. After the watercolor dried a bit I went back and did a quick splatter with the watercolors as well. After my panel was really dry I stamped this cute sentiment using Memento Tuxedo Black ink. I stamped the stitched line block in Glacier cardstock along the top edge for a sort of washi tape effect. Then I added the stitching in grey thread. I stamped the banner image in Sunset ink, then outlined it with a journaling pen before fussy cutting the image and attaching it with Liquid Glass. I scattered on some enamel stars, grey enamel dots, and Bitty Sparkles, plus filled in the BIG dots with clear shimmer pen for a happy bit of sparkle. I mounted the completed panel on a piece of sanded Glacier cardstock. Make sure you ask your consultant or click here to get your Cheers, 2016! set, only available in the month of November. Next up on the hop is TRACI'S BLOG. Happy hopping! What a fun, artsy design! Love the splatter detail! Thanks so much for playing along with us at Color Throwdown! Lots of great techniques on this card!! Totally love this, the detail that you put into this card is fabulous. Love this card! Great colours and details. What an awesome design...love the background you created and the little banners in the corner!!! Thanks so much for playing along with us at the Color Throwdown!!! Beautiful card with so much detail and texture! You are definitely a watercolor queen! Those watercolour splatters are fabulous! Fabulous card and I do love the water coloring behind the sentiment:) Thank you for joining us over at Friday Mashup. Terrific card, love how you used the sketch! Love your painted background and the big sentiment. Thank you for playing with us at The Friday Mashup. Love how you used watercolor on your card. Great job!